Ready-to-Drink ENSURE PLUS is a source of complete, balanced nutrition that provides concentrated calories, protein, and fiber to help patients gain or maintain healthy weight. For oral use. It can be used with or between meals or as a meal replacement. Water, Corn Maltodextrin, Sugar (Sucrose), Milk Protein Concentrate, Canola Oil, Soy Protein Concentrate, Corn Oil, Short-Chain Fructooligosaccharides, Whey Protein Concentrate, Magnesium Phosphate, Natural and Artificial Flavors, Potassium Citrate, Sodium Citrate, Soy Lecithin, Calcium Phosphate, Potassium Chloride, Salt (Sodium Chloride), Choline Chloride, Ascorbic Acid, Carrageenan, Ferrous Sulfate, dl-Alpha-Tocopheryl Acetate, Zinc Sulfate, Niacinamide, Manganese Sulfate, Calcium Pantothenate, Cupric Sulfate, Vitamin A Palmitate, Thiamine Chloride Hydrochloride, Pyridoxine Hydrochloride, Riboflavin, Folic Acid, Chromium Chloride, Biotin, Sodium Molybdate, Sodium Selenate, Potassium Iodide, Phylloquinone, Vitamin D3, and Cyanocobalamin. (FAN 8284-04) Contains milk and soy ingredients. Water, Corn Maltodextrin, Sugar (Sucrose), Milk Protein Concentrate, Canola Oil, Soy Protein Concentrate, Corn Oil, Short-Chain Fructooligosaccharides, Whey Protein Concentrate, Natural and Artificial Flavors, Magnesium Phosphate, Potassium Citrate, Sodium Citrate, Soy Lecithin, Calcium Phosphate, Caramel Color, Potassium Chloride, Salt (Sodium Chloride), Choline Chloride, Ascorbic Acid, Carrageenan, Ferrous Sulfate, dl-Alpha-Tocopheryl Acetate, Zinc Sulfate, Niacinamide, Manganese Sulfate, Calcium Pantothenate, Cupric Sulfate, Vitamin A Palmitate, Thiamine Chloride Hydrochloride, Pyridoxine Hydrochloride, Riboflavin, Folic Acid, Chromium Chloride, Biotin, Sodium Molybdate, Sodium Selenate, Potassium Iodide, Phylloquinone, Vitamin D3, and Cyanocobalamin. (FAN 8284-07) Contains milk and soy ingredients. Water, Corn Maltodextrin, Sugar (Sucrose), Milk Protein Concentrate, Canola Oil, Soy Protein Concentrate, Corn Oil, Cocoa Powder (Processed with Alkali), Short-Chain Fructooligosaccharides, Potassium Citrate,Whey Protein Concentrate, Magnesium Phosphate, Natural and Artificial Flavors, Sodium Citrate, Soy Lecithin, Calcium Phosphate, Potassium Chloride, Salt (Sodium Chloride), Choline Chloride, Ascorbic Acid, Carrageenan, Ferric Phosphate, dl-Alpha-Tocopheryl Acetate, Zinc Sulfate, Niacinamide, Manganese Sulfate, Calcium Pantothenate, Cupric Sulfate, Vitamin A Palmitate, Thiamine Chloride Hydrochloride, Pyridoxine Hydrochloride, Riboflavin, Folic Acid, Chromium Chloride, Biotin, Sodium Molybdate, Sodium Selenate, Potassium Iodide, Phylloquinone, Cyanocobalamin, and Vitamin D3. (FAN 8284-10) Contains milk and soy ingredients. Water, Corn Maltodextrin, Sugar (Sucrose), Milk Protein Concentrate, Canola Oil, Soy Protein Concentrate, Corn Oil, Short-Chain Fructooligosaccharides, Natural and Artificial Flavors, Whey Protein Concentrate, Magnesium Phosphate, Potassium Citrate, Sodium Citrate, Soy Lecithin, Calcium Phosphate, Potassium Chloride, Salt (Sodium Chloride), Choline Chloride, Ascorbic Acid, Carrageenan, Ferrous Sulfate, dl-Alpha-Tocopheryl Acetate, Zinc Sulfate, Niacinamide, Manganese Sulfate, Calcium Pantothenate, Cupric Sulfate, Vitamin A Palmitate, Thiamine Chloride Hydrochloride, Pyridoxine Hydrochloride, Riboflavin, Folic Acid, Chromium Chloride, Biotin, Sodium Molybdate, Sodium Selenate, Potassium Iodide, Phylloquinone, Vitamin D3, and Cyanocobalamin. (FAN 8284-07) Contains milk and soy ingredients. Water, Corn Maltodextrin, Sugar (Sucrose), Milk Protein Concentrate, Canola Oil, Soy Protein Concentrate, Corn Oil, Short-Chain Fructooligosaccharides, Whey Protein Concentrate, Magnesium Phosphate, Potassium Citrate, Sodium Citrate, Soy Lecithin, Natural and Artificial Flavors, Calcium Phosphate, Potassium Chloride, Salt (Sodium Chloride), Choline Chloride, Ascorbic Acid, Carrageenan, Ferrous Sulfate, dl-Alpha-Tocopheryl Acetate, Zinc Sulfate, Niacinamide, Manganese Sulfate, Calcium Pantothenate, FD&C Red #3, Cupric Sulfate, Vitamin A Palmitate, Thiamine Chloride Hydrochloride, Pyridoxine Hydrochloride, Riboflavin, Folic Acid, Chromium Chloride, FD&C Yellow #6, Biotin, Sodium Molybdate, Sodium Selenate, Potassium Iodide, FD&C Blue #1, Phylloquinone, Vitamin D3, and Cyanocobalamin. (FAN 8284-07) Contains milk and soy ingredients. Water, Corn Maltodextrin, Sugar, Milk Protein Concentrate, Canola Oil, Cocoa (Processed with Alkali), Corn Oil, Soy Protein Isolate. Less than 0.5% of: Potassium Citrate, Magnesium Phosphate, Soy Lecithin, Sodium Citrate, Natural & Artificial Flavor, Potassium Chloride, Calcium Phosphate, Choline Chloride, Ascorbic Acid, Salt, Carrageenan, Potassium Hydroxide, dl-Alpha-Tocopheryl Acetate, Zinc Sulfate, Niacinamide, Ferrous Sulfate, Calcium Pantothenate, Cupric Sulfate, Manganese Sulfate, Chromium Chloride, FD&C Red #3, Vitamin A Palmitate, Thiamine Chloride Hydrochloride, Pyridoxine Hydrochloride, Riboflavin, Folic Acid, Biotin, Sodium Selenate, Potassium Iodide, Sodium Molybdate, Phylloquinone, Cyanocobalamin, and Vitamin D3. For years I have struggled with my weight. It didn't matter how much I ate or what I ate, I just couldn't gain anything. Back in January of 2008 I was 80lbs. I started drinking Ensure Plus about the end of January. I know weigh 114lbs. I drink at least one a day, usually in the morning. and occasionally will have one at night before bed. It has made a huge difference in how I look and feel. I finally look healthy and I feel great. I have so much more energy. I would recommend this to everyone that has under weight issues or just needs a boost in energy. My husband has alzheimer and will not eat regular food. The Ensure plus, basisly is saving his life, as he receive the requried vitamin he needs, as well as protein and calories. It is an easy to served meal and along with ice cream keeps im from getting malnutrision. It also and taste great. Good Taste. Easy To Use. This product is used for my 91 year old Mother who is a hospice pt.This is the only product we have found that she will drink. Good Taste. Simple To Take. Easy To Use. Good Value. Easy To Use. Good Value. Gives you energy. Effective. High Protein. Convenient. Daily Use. Women. Men. Everyday. 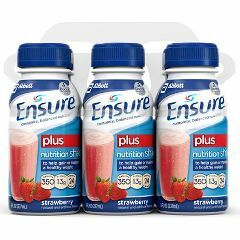 Ensure Plus gives me all the vitamins and minerals I need without a hassle. My doctor says you can live on it. My nutritionist prescribed it when I had dental surgery. It allows you to keep working without interruption, and if you freeze it a little, WOW!!! Grab yourself some fresh fruit, some steamed vegetables and you're set. But if you're (see title) Ensure Plus is perfect. Allegro Medical gives a great value for the money. Do ensure plus contain MSG? Asked on May 27, 2012 12:22:57 AM by Mark from Chino Hills, Ca. Please check with your doctor for any kind of drug interactions. Is Ensure Plus safe for my underweight 11 1/2 year old daughter, weighs only 60 pounds and only 4'7" in height? Need to boost her appetite! She eats like a 5 year old,not much appetite! Yes it is safe for kids. Both my kids drink 1-2 daily (beginning at age 5) due to weight loss from taking Adderall XR. Will it help you gain weight??? If it does how long till you see the results??? and how many shakes do i have to drink to see results fast? How many bottles of Ensure can one drink per day after a surgery? Me personally drinks ensure plus..i think it safe to drink three in between meal..hope this helps u. My father in law has anemia,low blood pressure,very much underweight,the doctor prescribed Ensure,does it cover by Medi-cal? How long after the Best Before date can an unopened bottle be safely drunk?